My healthy BBQ eggplant salad is the perfect menu idea to enjoy whilst the grill is warming up. In Turkey it would be a smoked Baba Ganoush recipe, in Greece call it Melitzanosalata and here in the UK we call it aubergine. Call it what you want, this stuff in a pitta will knock em dead, if you like hummus then you have to give this a go and you might never go back. To be honest when I first looked at it, it didn’t appeal……then I tasted it! 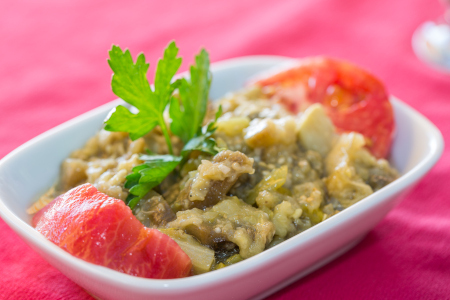 This BBQ eggplant salad is a great Greek / Turkish institution and a really tasty opener to any barbecue cookout. Don’t be confused with the word “salad” though, there isn’t a lettuce leaf in site – in essence it’s a smoky purée that works really well as a dip. What you choose to dip in is of course your choice. I usually go for breadsticks, pitta bread (sliced up) or vegetable sticks such as carrot, celery or cucumber. If you want to continue the Greek theme, check out my Tzaziki recipe, that really complements the eggplant. Wash the aubergines / eggplants and cut off the end where the stalk was attached. It's a fruit that's high in water content and if you get a steam build up in the aubergine it can explode, cutting the top of like this not only keeps you safe, it also saves you ½ an hour cleaning up the mess. Place the aubergines / eggplants over direct heat to start with and char the skin, turning them occasionally until charred all over. No cook indirectly in your smoker at 320°F or 160°C for an hour until black and shriveled. They're ready when they are soft all the way through and collapsing in on themselves. Allow them to cool for a while and whilst still warm to the tough, slice the aubergines length-ways in half and scoop out the flesh. Put the flesh in a sieve and apply some pressure to strain out any excess liquid. Chop it up really finely, throw it in a bowl and “mush” with a fork whilst adding the other ingredients. (except the olives tomatoes and peppers). Eventually you end up with a beautifully sweet pulp. Serve the BBQ eggplant salad in the bowl and garnish with slices of the olives, tomatoes and peppers + a sprig or two of parsley. It is perfectly acceptable to serve this smoked baba ganoush recipe immediately whilst slightly warm or if you prefer, give it 30 minutes in the refrigerator to chill.